For Consideration: "MICHEL LEGRAND - The Music Never Ends"
She is featured on LEGRAND'S recent CD, "The RCA YEARS" with Lena Horne and Jack Jones and "MICHEL LEGRAND & FRIENDS," performing with Michel - a duet of his Oscar-nominated song, "Pieces of Dreams." "The possessor of an incredible vocal instrument," MORT GOODE, Grammy award nominee and pop and jazz Music Critic "A singer with an exciting vocal ability," BILLBOARD MAGAZINE "A well-received standing ovation. Thank you!" BRIAN LYNCH, Executive Director N. Central College of the Performing Arts "WINDMILLS OF YOUR MIND" sung by Laury Shelley - one of i-tunes "Top 100 Jazz releases"
Praised by Billboard Magazine as "a singer with exciting vocal ability," singer/songwriter Laury Shelley broke onto the international music scene at age 19, when she was discovered by Oscar and Grammy Award-winning composer Michel Legrand who called her "a very talented singer." Following her time with Legrand, Laury went on to perform at some of the nation's top clubs, concert halls and music festivals including LA's Cinegrill and The Gardenia, New York City's Metropolitan Room, Milwaukee's Summerfest and Chicago's Jazz Showcase and the Chicago Jazz Festival. Hailed as "the possessor of an incredible vocal instrument," by Grammy Award nominee and pop and jazz music critic Mort Goode, Laury's debut solo recording Pieces of Dreams received critical acclaim, international airplay. The accolades that included being named "Artist of the Month" by WFLM Chicago's Smooth 87.7FM and a nationally televised performance on the CW/WGN America's Midday Show. Touring with Legrand as his vocal soloist for over five years, Laury made her debut at the prestigious Carnegie Hall, The Sahara Hotel in Vegas, Red Rocks Amphitheater in Denver, Miami's Stars Under The Stars Concert Series at Marine Stadium, The Westbury Theatre in New York, The Forum in Montreal Canada, as well as concert halls in San Francisco, Dallas, Pittsburgh, New Orleans and Los Angeles. It also gave Laury the honor of sharing stages with many musical icons including Tony Bennett, Buddy Rich, Cleo Laine and John Dankworth, while also performing and recording with jazz greats Phil Woods, Ron Carter, Grady Tate, Randy Brecker, and Joe Beck. Laury's years with Michel are immortalized on two RCA recordings, featuring her duet with Legrand on his Oscar-nominated song Pieces Of Dreams: Michel Legrand & Friends and Michel Legrand The RCA Years, that also includes musical luminaries Lena Horne and Jack Jones. 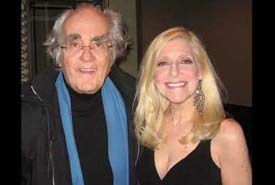 Laury historically reunited with Michel Legrand, along with bassist John Patitucci and drummer Willie Jones III, at The Dakota Jazz Club in Minneapolis on his 2011/12 U.S .tour.. In 2017, in honor of Legrand's 85th birthday, Laury performed a tribute concert at the Madden Theatre PAC, entitled The Music Never Ends to audience acclaim. It resulted in another live TV performance on CW/WGN Midday Show, of the Grammy Award-winning tune The Hands of Time (Brian's Song). Because of her vast musical vocal flexibility, Laury quickly became one of the most in-demand commercial vocalists for clients such as McDonald's, Kellogg's, United Airlines, 7-Up, Coors Light Beer, American Greeting Cards and many others. Displaying enormous range and versatility, Laury puts her own indelible stamp on every song she sings, whether it's pop, jazz, rock, or soul. She has a voice that acts as its' own instrument and has been called "a musician's musician," and legendary Grammy Award-winning alto saxophonist Phil Woods stating "like a fine wine, Laury Shelley is better than ever." She makes each performance unforgettable and is someone you need to hear and experience. Check out Laury on Facebook! Chicago Tribune Article: Chicago Jazz Singer Laury Shelley Sings the Songs of Michel Legrand - There's a Reason For That!